I am currently experiencing a post-exhausting-week cold. My throat began itching on the drive home Friday, and now I am in full blown green snot mode. (You’re welcome.) Andrew woke me up in the middle of the night and said, “Catherine… roll over. You’re making funny noises….and you’re right in my face.” 😀 I consider myself to have a strong immune system, but I know I am highly susceptible to getting sick when I am stressed and/or overly tired. Oy. I spent most of Saturday recuperating, and on Sunday I met up with with my college housemates for an impromptu reunion. We met at Kate’s apartment in the Fan and walked to Garnett’s Cafe for lunch. I’d never been, but it was delicious, and they have gluten-free bread, so I will have to go back with Andrew very soon! From there we walked to Kuba Kuba for their iced cafes con leche (by the way, I have been far too lax about the amount of dairy I’m eating…) By the time we arrived back at Kate’s after two hours of talking, eating, talking, and walking, I was exhausted and had a bad case of medicine-head. I drove home to take a nap, and the girls went to the river, with the plan to come over to our house later for dinner, prepared by Chef Andrew. 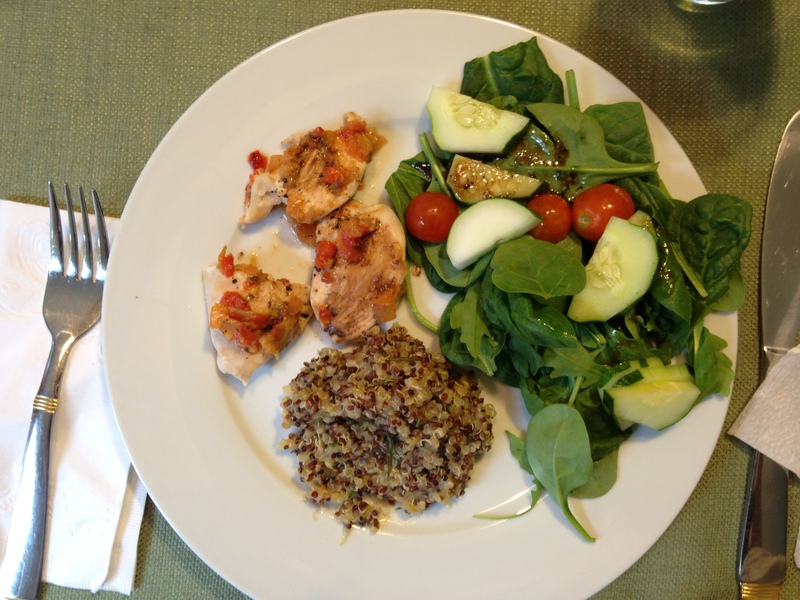 In addition to salad, we had baked chicken with a roasted red pepper and artichoke tapenade (the tapenade was from Trader Joe’s) and a lemon-basil quinoa. We ended the day with a trip to Ray’s for ice cream and Italian water ice. As always, it’s so good for my soul to spend time with this crew, even when I’m not feeling well! 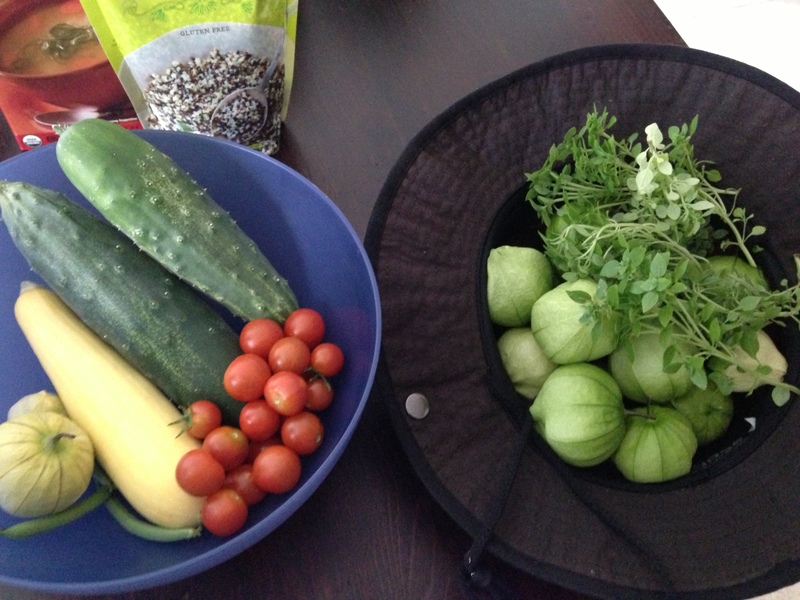 This entry was posted in Fun and tagged food, friends, nutrition, RVA, silly, stress, vegetables by Catherine @ A Two Storey Home. Bookmark the permalink. As always, love reading about your life. Love you! I used to live on Grace Street in the Fan District – circa 1989 – love that part of town! Although I do remember Shockoe Slip being fun to go to as well – have you been there?? Oh, how cool! Shockoe Slip is still a lot of fun! Nooo! Don’t be sick anymore! That’s the worst in the summer! What are those small green bowls by the squash in that picture? It looks really good… But I’m stumped! They do all look beautiful! Yay for a fun day! They’re tomatillos! Aren’t they funny looking? They grow inside a husk, which then kind of shrivels and you peel it off. They are really good!